Many of us take making a cup of tea or our lunch for granted. We go to the kitchen, pop on the kettle and head to the fridge. However, for many people these basic tasks, that so many of us take for granted, can be very difficult if the area is not accessible for people with disabilities. Some wheelchair users may find the kitchen worktops too high or the sink and taps too far to reach. People with visual impairment may struggle to navigate around the room finding it a challenge to identify the units from the walls. People with dementia may find the kitchen environment to be hostile if the colours are not considerate or if there is too much pattern in the flooring. There are lots of disabilities which make the humble kitchen or staff refreshment area a challenge for some people. Consider using ‘rise and fall’ work tops for hobs and food prep areas. These electrical devices allow the hob, sinks or worktops to raise and lower to help people to be able to reach more easily. Choose your colour scheme carefully. Good planning can allow your kitchen to be friendly to people with visual impairment and to help people with dementia. Colours are very important to both groups. Make sure you select the right flooring: Again, consider colour to make sure the walls, floors and cabinets are all contrasting colours. Choose dementia friendly products which offer good standards of slip resistance. Select disabled friendly handles; think about the door handles on the units and handles on the taps. If you suffered from arthritis or were disabled in some way, certain handles limit access for people. Think about storage: there are some great devices for helping people to access the recesses of kitchen units. Drop down shelves, rotunda units and unit heights can all make accessibility for all more achievable. Although E and M Services specialises in flooring services we also have a special projects division. 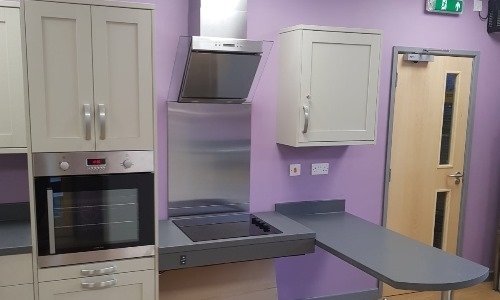 We carry out all types of unusual projects ranging from accessible kitchens to painting the inside of Churches, to carrying out reception refurbishments. Please don’t hesitate to get in touch to find out more. E and M Services are specialist flooring contractors, based in Coventry in the West Midlands. We work across the Midlands providing excellent flooring installation for commercial and domestic clients. Many of our clients include hospitals, schools and colleges as well as retailers, coffee shops and shop fitting firms. If we can be of further assistance, please do not hesitate to get in touch on 024 7665 9616. Which flooring solution is right for my business?